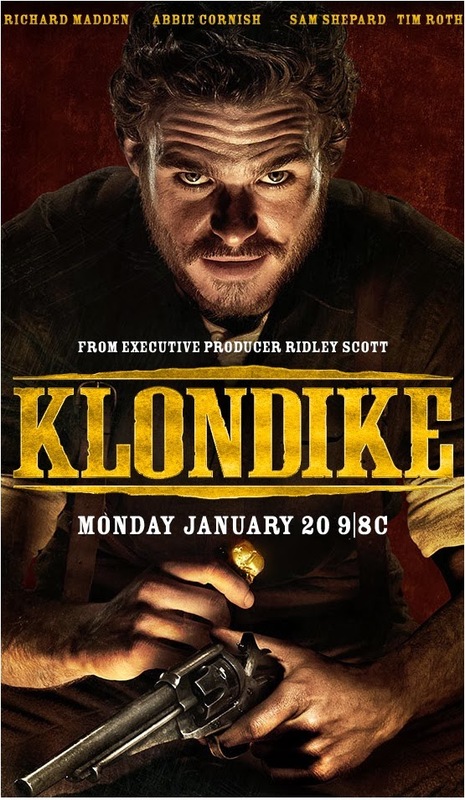 Another new historical series starting this month on television, beside BLACK SAILS and THE MUSKETEERS, is Discovery's scripted mini series KLONDIKE which will start digging its way into the small screens January 20th starring our dearest King of the North Richard Madden produced by Ridley Scott! 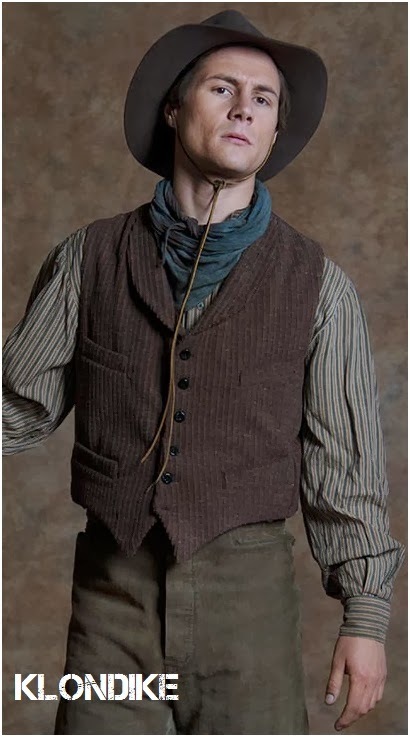 Discovery’s first scripted mini-series, based on Charlotte Gray’s book 'Gold Diggers: Striking It Rich in the Klondike', brings to life the story of six strangers and their collective fight for survival and wealth in a small frontier town in the remote KLONDIKE following the lives of two childhood best friends, Bill and Epstein, in the late 1890s as they flock to the gold rush capital in the untamed Yukon Territory. This man-versus-nature tale places our heroes in a land full of undiscovered wealth, but ravaged by harsh conditions, unpredictable weather and desperate, dangerous characters including greedy businessmen, seductive courtesans and native tribes witnessing the destruction of their people and land by opportunistic entrepreneurs. Dreading a lifetime spent working behind a desk, Bill Haskell sets out to carve a place for himself in the booming times of the KLONDIKE Gold Rush. He and his best friend, Byron Epstein, leave New York City and make the months long journey to Dawson City and the gold fields of the KLONDIKE. Handsome, intelligent and ambitious, Bill catches the attention of Belinda Mulrooney, one of Dawson’s most prominent figures. After some early trouble in town, he stakes his claim out on the creeks and sets about the business of mining gold. It isn’t long before Bill becomes consumed with finding gold and leverages everything he owns on the promise of a pay streak. He soon realizes that only a lucky few will strike it rich and as winter sets in, those lucky few become prey for the unlucky. To survive, Bill must fight desperate men, his own lust for revenge and the mighty, unforgiving KLONDIKE. Belinda Mulrooney knows that in 1897 the only place where a woman can make her mark and maintain her independence is in a town like Dawson City, a place so isolated and remote that gender is an afterthought to people in need of shelter and supplies to stay alive. A shrewd businesswoman, Belinda made it to Dawson early and began selling the goods she brought with her to the miners. With the money she made, she doubled down and began buying businesses, then real estate. By the time the KLONDIKE Gold Rush was in full swing, she was set up nicely as the hotel, restaurant and sawmill magnate of Dawson. While building her dream property, The Fairview Hotel, soon to be largest and finest hotel in all of the KLONDIKE, two men arrive in Dawson that upset her focus and her power – Bill Haskell and The Count. A dangerous man of questionable nobility, The Count comes to Dawson and upends Belinda's world when he makes a play to be the new land baron of Dawson City. He sets his sights on a property owned by Father Judge, the only priest in town, and makes it clear that Judge’s relationship with the church won’t stop him from taking what he wants. In lawless Dawson, The Count’s wickedness knows no bounds and he employees a posse of murderous outlaws to make sure his desires are met. Byron Epstein has an influence over his good friend Bill Haskell that changes both their lives. With his cavalier, devil-may-care attitude, Byron sees a world of opportunities in the KLONDIKE and it’s his prompting that starts the two friends on their dramatic journey across treacherous terrain and into Dawson City. Beautiful Sabine charms her way to Dawson City looking to trade on her looks and make a quick killing as a courtesan. But the dangerous boomtown has a way of turning dreams into dust and her world spirals into a place darker than she bargained for. It isn’t until an unlikely player intercedes that Sabine finds any chance at redemption. Jack London is in Dawson for the stories and the adventure. Jack envisions himself a famous writer, gathering the stories that will make him a legend. He spends most of his time drinking, listening and writing. 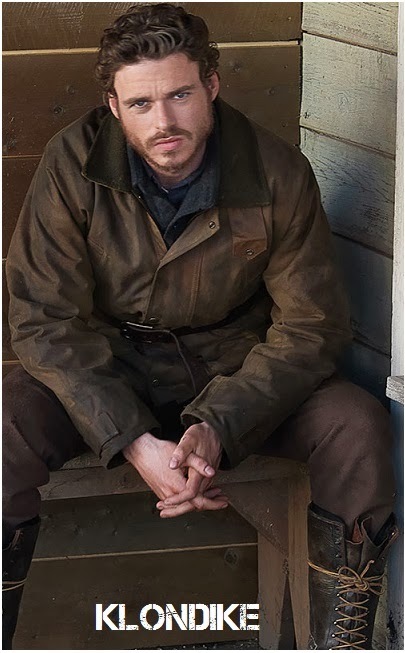 He makes it out of Dawson and back to fame and fortune, but the KLONDIKE takes her cut – he arrived at 19 and after one season leaves a toothless alcoholic looking 30. I like Tim Roth a lot. Loved him in Lie to Me. Unfortunate that she had a bad mix with him. I hear stories about this kind of stuff a lot, where the actors, writers or singers aren't as nice as they seemed they would be. yep, she spoke about him here in my comments recently, he behaved like a pompous idiot during a flight to USA on which she was too as a passanger and they apparently had a nasty exchange too :) Go, Annzie, go, Annzie! Cold here today. Canceled my plans and am instead working indoors. Much warmer. Could be interesting, but I won't be looking forward to it either. Have a lovely Monday. American versions of Canadian history usually make the situation out to be much more lawless and violent than it actually was. The North West Mounted Police actually kept things in check quite well, all things considered. I'm not surprised, the Americans always love to falsify history and facts the way it suits them. Roth Rocks... and why is the one girl wearing rubber pants? Looking forward to this one... thank you! Crikey ... I've forgotten what I was going to say now. Oh, well. It can't have been very interesting anyway :)! I'm just fighting for justice like any other vigilante! Ha, I seriously doubt that women were wearing skin tight leather pants back then. I like Abbie Cornish, but couldn't they have done better w/ the costuming. I'm thinking this was fan service for the guys. So are the men wearing skin tight leather too? I Like Tim Roth, and the leather pants! Although her outfit looks like it could have been on Firefly. 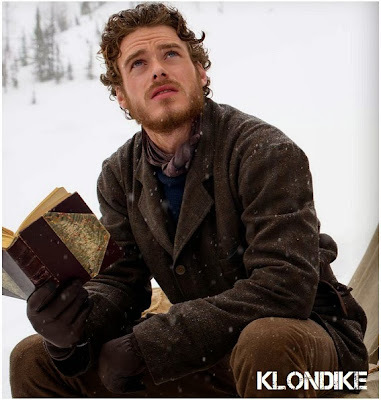 MMMMM I think Klondike struck gold with Mr. Madden. Nom, Nom!!! oure gold, sister Debs, pure gold! I agree. I can't wait to see this and I can't wait to see Richard in it. he will be amazing in it! wait, this isn't about delicious ice cream? Hahaha at Adams comment. Leave it to us American's to think of ice cream bars every time we hear Klondike! We like historical shows. 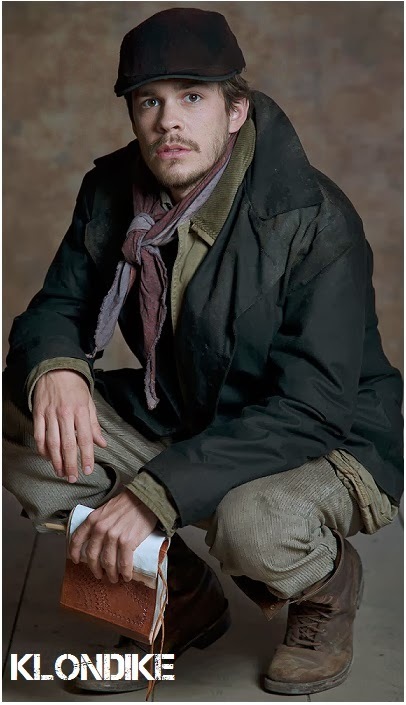 My husband was huge on Deadwood. If this is as good as that, we've got a winner! It could be yours and hubs' genre! This is a must see for me! And some lovely ladies! 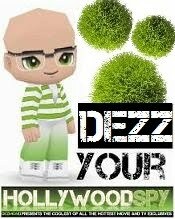 Don't forget to torrent it, Peter, it starts real soon!